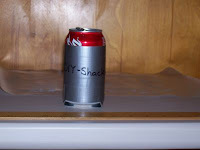 For the Duct Tape Can Cooler your going to need a few minutes, some duct tape and your Swiss army knife. For more precision work include the optional ruler and wax paper. 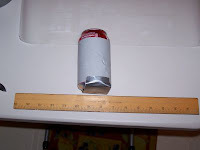 This ain't rocket science so you can improvise if you have to for measurements. Oh yeah, you need a can, for your form. 1. Cut four pieces of Duct Tape at least 9 inches long. 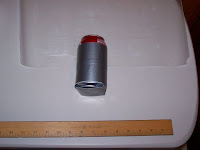 This will wrap around most common cans. Cut two pieces about 4 inches long, and this will make the bottom. The bottom is optional as you really only need side covers, so skip the bottom section if you wish. No bottom, skip to step 4. Place these strips on your wax paper for easy handling. 2. If your going to make a bottom, now stick the two 4 each pieces together, adhesive to adhesive. This can be a little tricky, so use your ruler to hold on piece down and lay the other pieces smoothly on top of that one. 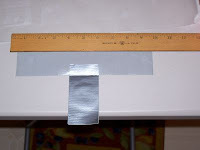 Remove ruler, smooth the tape and bend on end at about 3/4 of and inch at 90 degrees. 3. If your including the bottom now's the time to stick it to one of your 9 inch strips. 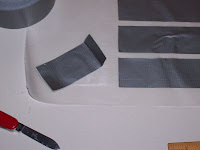 Stick the bent area flush with one side of the tape, in the approximate middle. Use your ruler here again to help hold the tape at bay. 4. 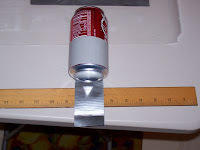 Now roll the 9 inch strip around your can with adhesive side out around the can, using the bottom as a guide so you will wrap straight. Wrap all the way around and overlap the tape. You get extra points for neatness here. 5. Wrap a second 9 inch strip around the can and overlapping the first wrap slightly, all the way around the can overlapping on the end again. After the wrap, fold your bottom over and secure to the other side. 6. Take your third and fourth strips now and repeat steps 4 and 5, but with the adhesive to adhesive. Take your time and things will work out smoothly. If you want to add additional strips to improve the insulation factor, then by all means do it now, and add all you want. Colored Duct Tape would also brighten things up a bit, but I prefer the battleship gray. You can decorate as you like, like a decorative skull and cross bones or maybe just your name in laundry marker. Be creative... and besides its just Duct Tape. These fold flat when your not using them, so put them under your car visor to take along with you. And as with most things duct tape, they are quite durable. You will probably lose it or have it stolen before you wear it out.